Considered as one of the few remaining premium properties this side of Manila , Otis 888 Residences offers a promising new lifestyle for a privileged few. For the discerning few, the gated community welcomes residents to everyday convenience, comfort, privacy and security. Otis 888 Residences aims to address the growing needs of those expanding Fil-Chinese families who require bigger living space. Manila is everything – a timeless city that is the center of culture, business, education, entertainment and much more. Situated in a 4-hectare prime property located along Otis Road , Manila , Otis 888 Residences is an upscale property like no other. 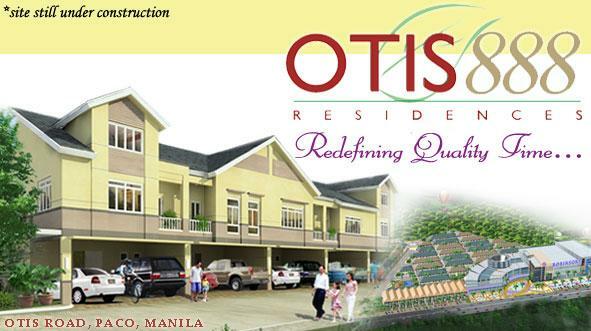 Developed and master planned by Robinsons Land with feng shui experts as consultants. It is just 2 kilometers or less than 10 minutes away from the Binondo and Makati area. Adding comfort is its wider roads, better environment and close proximity to nearby schools like St. Peters , St. Jude, Chiang Kai Shek, Uno, De La Salle-Taft, Malayan High School of Science, St. Stephen, UST, and San Beda. Otis 888 Residences is also near to leading shopping malls like Robinsons Place Manila and medical establishments like Manila Doctors and Manila Medical Center . Just a few minutes drive, residents can fully enjoy the panoramic beauty of the Manila Bay , its splendid food, lovely parks and great nightlife. Otis 888 Residences will be around 200 townhouse units development which will primarily cater to the Filipino Chinese living in the Binondo Chinatown and nearby areas. It will consist of a mix of 3-BR and 4-BR townhouse models with 2-car garage, to suit the discerning tastes and need for wider space and greeneries of its target clientele. Units range from P6.6 million and up with floor areas ranging of 138, 168 and 188 square meters. All units will have interior pocket gardens and most corner units will have separate strip gardens to maximize breathing space. A hectare of the property has been allocated for the development of a community strip mall which is planned to house a supermarket as well as a mix of retail, dining, and service outlets. The mall and the nearby hospitals, schools, and other commercial establishments will afford residents easy and safer access to basic needs. With wide outdoor open space and numerous exclusive amenities to choose from, you can pursue a healthy and well-balanced lifestyle will allow you to run, play and enjoy life's colorful moments. OTIS 888 TOWNHOUSE INQUIRY FORM.